International Journal of Research in Health Sciences,2015,3,2,337-344. 1-Department of E.N.T, 2-Department of Radiodiagnosis, 3-Department of E.N.T, Dr. B.R.A.M Hospital, Pt. JNM Medical College, Raipur (C.G. ), INDIA. Introduction- Vascular tumors are tumors arising from blood vessels.Vascular tumors in ear nose and throat are rare but not uncommon. Tumor embolisation is defined as the blockage of the vascular supply to a tumor. 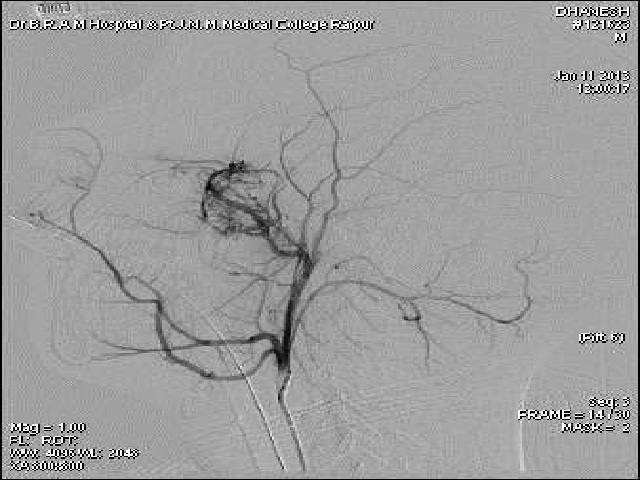 The blockage is usually performed through an endovascular approach but may also be performed by Direct Percutanous injection of embolic agent into the tumour. There are many advantages of pre surgical embolisation. With this background, the present study was conducted to evaluate the role of Preoperative embolisation in surgery of Juvenile Nasopharyngeal Angiofibroma cases attending a tertiary care hospital of Raipur city (C.G. ), India. Materials and Methods- The present case control study was conducted in the department of E.N.T. and department of Radiodiagnosis , Dr. B.R.A.M. Hospital, Pt. J.N.M. Medical College, Raipur (C.G.) India during study period November 2013 to October 2014. The cases of JNA then were categorised into stage according to FISCH classification. Embolisation was then carried out by superselective cathetarisation or Percutaneous method by interventional radiologist. Data was compiled in MS excel and checked for its completeness, correctness and then it was analyzed. Results- Mean age of study subjects was 14.5yr with S.D. + 0.940. Embolised cases consume less intraoperative time as compared to non embolised cases. Embolised cases had less postoperative stay than non embolised cases which was extending to 3 weeks. Conclusion- In this study we conclude that Presurgical endovascular embolisation has definite role in the management of juvenile nasopharyngeal angiofibroma.